Zimbabwe’s beekeepers won’t let you go near their forest. Hundreds of their beehives are hidden within a dense patch of forest along the river in the Mpudzi Resettlement, and the beekeepers watch out for the trees just as vehemently as their bees. They need to since the country’s forests have been dwindling rapidly due to tobacco farmers cutting them down for wood to cure their crop. With this practice, the bees’ habitat is also destroyed. Now, more than 50,000 beekeepers are helping to protect the forests from overcutting in Zimbabwe, a practice that had become commonplace, not just from Tobacco farmers’ practices, but also due to frequent power outages in nearby urban and pre-urban areas. Fortunately, the profitability of beekeeping is quickly outpacing other, more destructive habits of Zimbabweans, such as the destruction of woodlots for tobacco. The government is also supporting the protection of these bee habitats through a program that trains beekeepers by way of the Department of Agricultural Technical and Extension Services (Agritex). Beekeepers have a great incentive to protect the forests where hives hang from trees. They can make a fair living selling beeswax, honey, and other products. Around $60 per hive per season is not an uncommon return on their investment. Furthermore, a large portion of the country’s honey comes from bees that reside in old-growth forests. 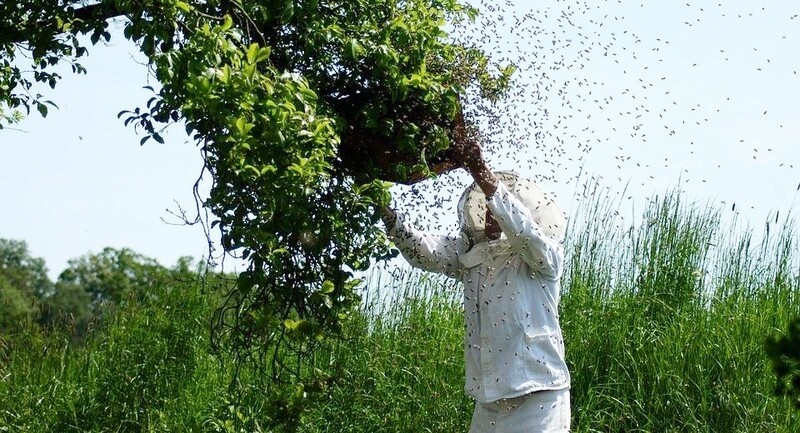 Without the beekeepers protecting the trees for the bees, a pristine habitat would continue to be destroyed at an alarming rate. Huge tracts of land were being demolished before the government of Zimbabwe intervened. At least one-fifth of the country’s 330,000 hectares (815,448 acres) of natural forest are mowed down by tobacco farmers every year, according to Zimbabwe’s Forestry Commission. Instead, the forests of Africa are making a comeback, which supports cleaner streams and less erosion. These small creatures, bees, are a microcosmic view of the macrocosmic health of our planet. A Yale report states that one of every three bites of food eaten worldwide depends on pollinators, especially bees, for a successful harvest. According to the U.S. Department of Agriculture, these little-winged workers pollinate 80 percent of our flowering crops, which constitute one-third of everything we eat. Plants depend on them for cross-pollination. With bees increasingly being threatened due to corporate agricultural practices which poison them with pesticides, habitats like old-growth forests become even more vital for their survival. This is simply a reminder that what is good for the bees is good for our ecology overall. Instead of desertification, ecological ruin, and the promotion of a cancer-crop, Zimbabwe is restoring nature’s balance by supporting the protection of bee habitats. Matinyadze says, “These trees belong to my bees.” He couldn’t be more right. This article (These Beekeepers Are Saving The Forest And Producing Honey At the Same Time) was originally created and published by Underground Reporter and is re-posted here with permission.